First Church of Christ, Scientist, Bangor is a branch of The Mother Church, The First Church of Christ, Scientist in Boston, Massachusetts. On September 29, 1898, members acted on a warrant for a church. Members voted to become an incorporated body in the Revised Statutes of the State of Maine, Chapter 12. During these early years, services were held successively in the Fraternal Union Hall, the United Friends Hall, Society Hall in the Rines Block, and in a hall in the Zoidis block. In 1917, property was purchased at 183 French Street in Bangor. The original building, known as the Christian Science Chapel was occupied in April of 1922. The need to expand became apparent, so work on a church building was begun in August 1935. Services were conducted in the completed building in January 1936 and the edifice was dedicated in December 1937. In January 1990, the church building at 183 French Street was sold. Services were held in rented space at 118 Harlow Street, while plans for a new location were developed. In March 1991, property was purchased on the corner of Broadway and Hobart Street. The foundation was completed before the end of the year and construction of a new church building began in January 1992. 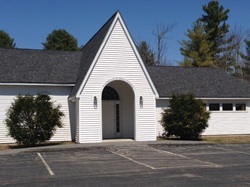 The first service in this building was held in June 1992. This edifice was dedicated in November of that year. Surely goodness and mercy shall follow me all the days of my life; and I will dwell in the house [the consciousness] of [Love] for ever. " 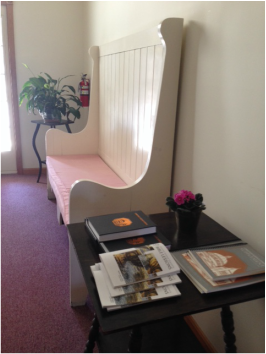 You will find a peaceful, contemplative atmosphere at our Sunday services. Let the Bible speak to you, as you listen to a beautifully developed lesson-sermon. Two Readers will read Biblical selections with correlative passages from the Christian Science textbook (Science and Health with Key to the Scriptures by Mary Baker Eddy). Hymns, music, moments for silent prayer and the Lord’s Prayer provide time for quiet reflection. Each lesson expounds on the nature of God and provides spiritual ideas to bless you in the week to come. These spiritually refreshing mid-week meetings open with a hymn and readings from the Bible and the Christian Science textbook, selected by the Reader who conducts the meeting. A portion of each meeting is set aside for those who wish to share insights, blessings and healings resulting from their study and practice of Christian Science. Gratitude has a healing power, and you can expect to depart with a lighter step. The atmosphere is informal, warm and welcoming. Visitors are welcome. Children and young people up to the age of 20 are welcome to join us for Sunday School. It meets during the worship service. Our teachers love to help students learn about God’s love, as revealed in the lives of prophets, Christ Jesus and the apostles. First lessons include the Ten Commandments, the Beatitudes, and the Lord’s Prayer, presented in a way that is meaningful to a child’s life. Further lessons draw on questions and answers from the weekly Bible lessons read in church services. The students learn of their true heritage as beloved children of God, created in His image and likeness, as presented in the first chapter of Genesis. They discover their natural receptivity to God’s positive direction in their lives. A Children’s Room is available for those too young for Sunday School. The Christian Science Reading Room includes a sales area, study room and lending library. The entrance is at the side of the church facing the driveway. You are invited to stop in to browse, look for articles of special interest, read the weekly Bible lesson or the latest Christian Science Monitor, or simply ask questions. Bible research materials are available as are writings about Christian Science. You can learn about the discoverer and founder of Christian Science, Mary Baker Eddy, through her writings and a large selection of biographies. Her major work, Science and Health with Key to the Scriptures, reveals the laws of God that Jesus taught, lived and loved. A site designed to heal, inspire, and guide you on your spiritual journey through the many resources of The Christian Science Publishing Society. View the Christian Science Journal, Sentinel, Herald and try out Web Radio and blogs all with articles and discussions about healing and spiritual growth. This site is oriented toward youthful thinkers who are engaging with spiritual values. It is sponsored by The First Church of Christ, Scientist and includes fresh music, honest questions and an exploration of the relevance of Christian Science and church to young adults. Check it out by clicking on the image above. Mary Baker Eddy grew up in a devout New England family and was an eager student of the Bible. After a remarkable healing in 1866, she searched the Scriptures to discern the laws of Christ healing, taught others to heal, and founded a church “to reinstate primitive Christianity and its lost element of healing." Learn more by clicking on the image above.